The Halterburn Valley lies barely a mile from the quiet Scottish border village of Kirk Yetholm and is surrounded by a bevy of superbly rounded, grass-covered hills. 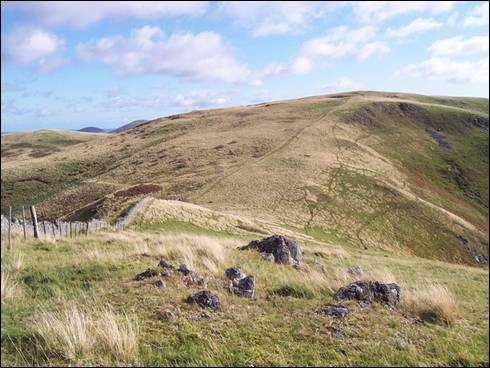 On the west side of the valley, Staerough, Sunnyside, Wildgoose and Latchly Hills join together to form one of the finest ridge walks in the Cheviot Hills. With the lure of a couple of English hills thrown in for good measure I set off on a crisp, clear October morning towards my first top of the day. I was straight on to the lush slopes of Staerough Hill and despite the relatively steep gradient I was soon planting my boots on the triangulation pillar-marked summit. As well as enjoying the eagle`s nest-view of Kirk Yetholm I soaked up the fantastic hill-packed panorama. Particularly impressive amongst an amazing array of small, green hills was the shapely, St. Cuthbert`s Way-crossed trio of Crookedshaws Hill, Wideopen Hill and Grubbit Law. For the next two rollercoaster miles of this `Premier League` ridge I was bombarded by a constant stream of eye-popping views. The hills rolled away in every direction as I headed from one summit to the next. A short, sharp descent followed by a steep climb and yet another view. Each new top offered a different perspective. So it continued until, just as the pangs of hunger were hinting that it might be time for lunch, I was standing on Latchly Hill dominated by the towering bulk of the nearby Curr. I sat beneath a perfect blue sky and a pale autumn moon munching merrily on my sandwiches. Once on shank`s pony again, I headed for the strangely-picturesque ruins of Old Halterburnhead and then abruptly uphill to the 420 metre high White Law. The summit of this windswept hill stands on English soil little more than the toss of a caber away from the cairn-capped Madam Law, my final hill of this fine walk. From there it was an easy stroll back into Scotland via the White Swire, first documented in 1222 and a favourite crossing place of generations of reivers and drovers. I was now close to the end of my walk but before calling it a day I wanted to visit the Stob Stanes, the two stones which mark the spot where the gypsy kings and queens were traditionally crowned. A short diversion satisfied my curiosity. Now, with nothing to hold me back, I raced downhill along the route of the Pennine Way to the ice-cold flow of the delightful Halter Burn and the perfect opportunity for a quick and easy scrub down. All too soon I was heading for home.